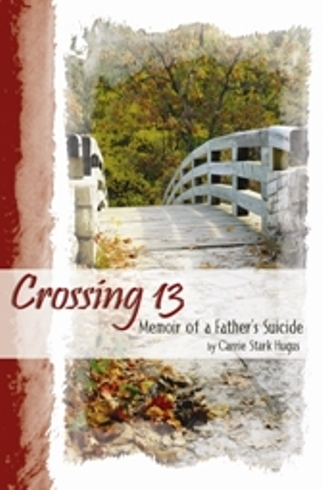 Crossing 13 is a captivating coming of age story about a thirteen-year-old girl whose life is instantly altered upon finding her father dead from suicide. As she rides the emotional waves of, shock, guilt, confusion, shame and the obsession with WHY, she begins to embrace her new normal life. Through each struggle you share her journey of complicated grief in the aftermath of a sudden loss. This story will give you insight to what it takes for a teenager to survive the self inflicted death of a parent and the compassion to understand and support them. "Heartbreaking and bleakly honest, Carrie shares her struggle to find a new normal following the suicide of her father just as she enters her teens. Young survivors of a parent's suicide will identify with and benefit from recognizing that their confusing, frightening grief responses are normal for what they have experienced. They will be encouraged by learning Carrie has grown through her grief and now enjoys a happy, stable adulthood." ~ LaRita Archibald, Founder of HEARTBEAT Support for Survivors After Suicide. "Powerful and brings to light an often overlooked group of survivors. Kudos to Carrie for her willingness to share her story!" ~ Jarrod Hindman, Program Manager, Office of Suicide Prevention, Prevention Services Division Colorado Department of Public Health and Environment. "This courageous account of one little girl's journey to understand why shows us that suicide changes everyone it touches and it takes a lifetime to recover. Crossing 13 will open your eyes, break your heart and touch your soul." ~ Tamra Monahan, author, Colorado's Best Bed and Breakfasts. "Through Carrie's authentic and courageous story of living through her father's suicide, we learn how to move beyond the depths of despair to a life of peace, profound empathy, wisdom, joy, and self love. This book is masterful in healing any person who has experienced great loss. "~ Karen Storsteen, M.S., Psychotherapist, Grief Counselor and Intuitive.